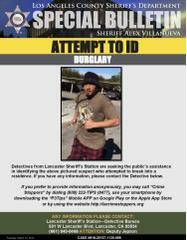 Lancaster Station Detectives seek public’s help in identifying man who attempted to break into a residence. Lancaster Sheriff's Station Deputies need your help identifying this man. He is wanted for attempting to break into a residence. If you recognize him or can give our detectives any information, please call Deputy Jepson at (661) 948-8466. Remember, if you see something, say something! Anyone with information about this incident is encouraged to contact the Los Angeles County Sheriff's Department's Lancaster Station at (661) 948-8466. If you prefer to provide information anonymously, you may call "Crime Stoppers" by dialing (800) 222-TIPS (8477), use your smartphone by downloading the “P3 MOBILE APP” on Google play or the App Store, or by using the website http://lacrimestoppers.org.